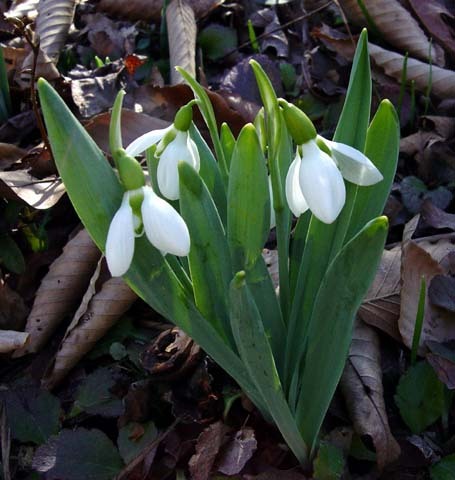 Galanthus is a genus in the Amaryllidaceae family with about 20 species distributed from Europe and western Asia to the Caspian Sea. 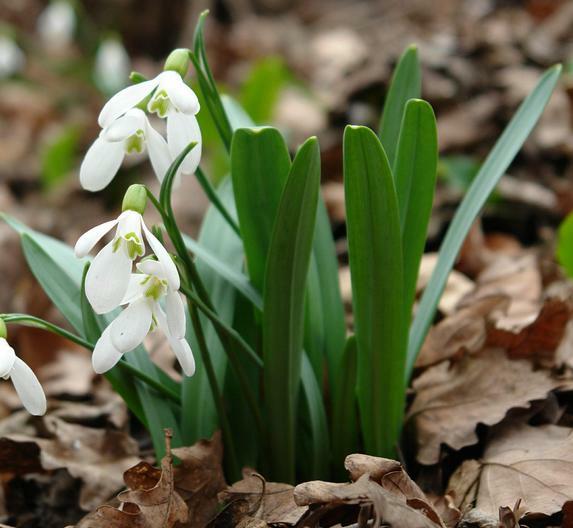 It was the subject of the topic of the week in February 2004. 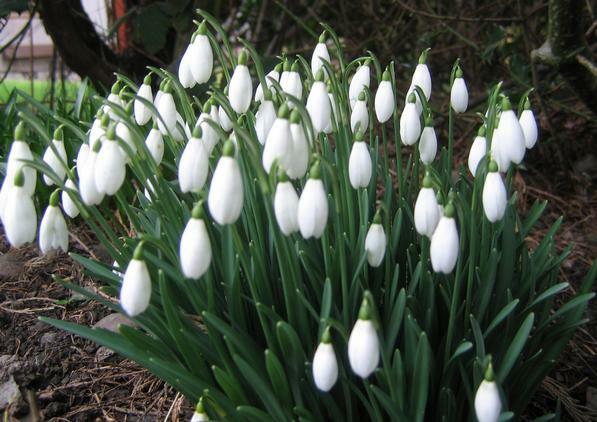 Seeds should be planted straight away in May. Very lightly on the surface covered by compost peat etc and kept slightly humid throughout the summer. 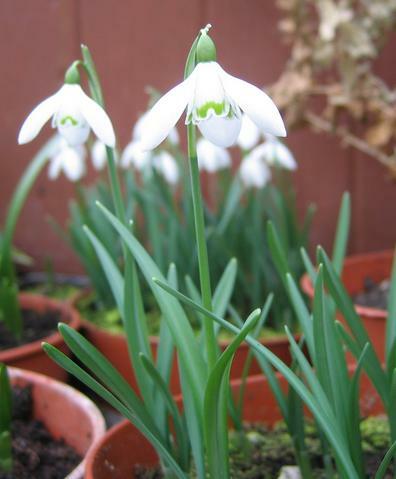 The plantlets appear at end of December (at the same time as the bulbs). 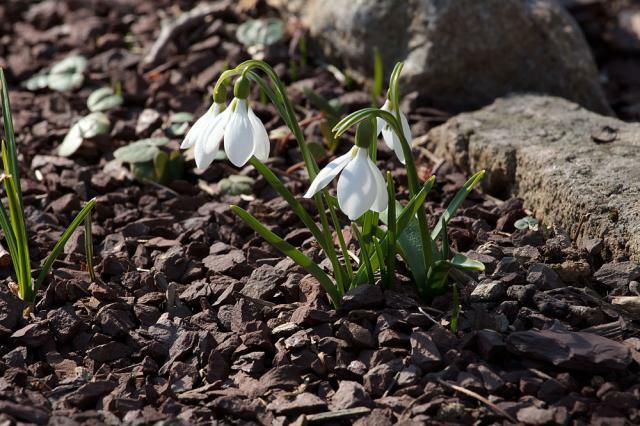 Sowing later in the summer has resulted in the past in very mediocre results (Lauw de Jager). 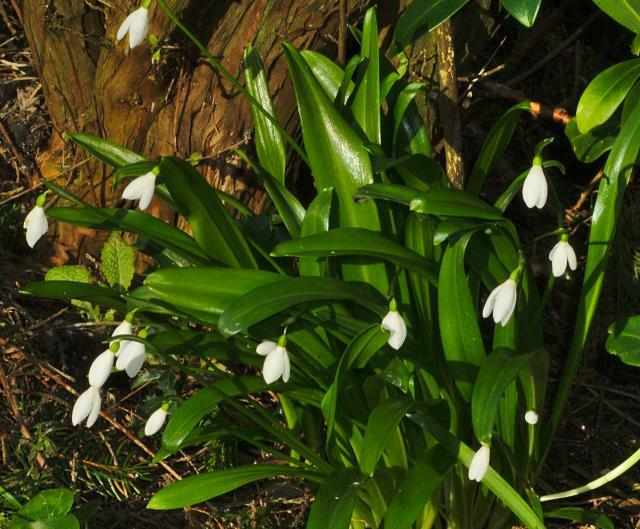 The Introduction was posted by John Grimshaw. 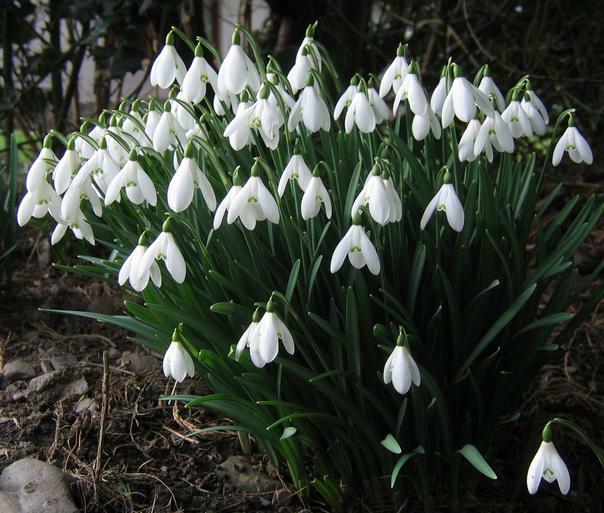 Reference books are Snowdrops, by Matt Bishop, Aaron Davis and John Grimshaw, published by the Griffin Press and The Genus Galanthus by A.P. Davis from the Royal Botanical Garden, Kew, and Timber Press. 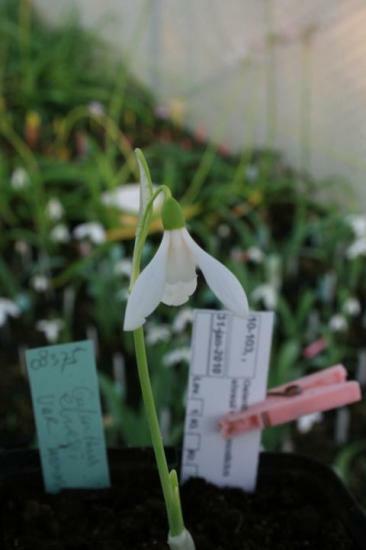 Galanthus × allenii Baker is considered to be a wild hybrid between Galanthus alpinus and Galanthus woronowii found in the Caucasus. 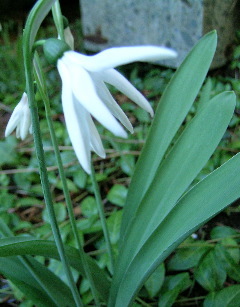 It has broad grey green leaves. The flowers are almond scented. 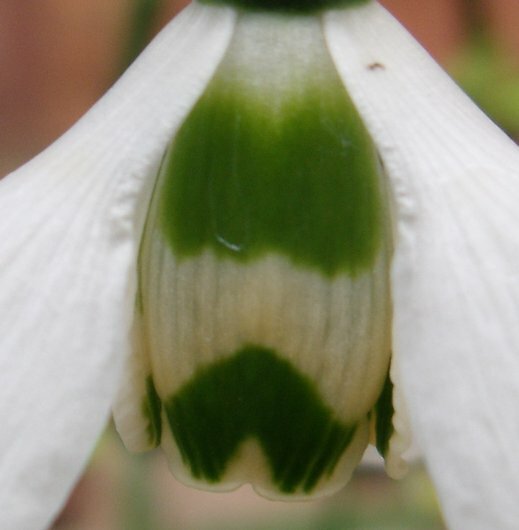 The outer segments are broadly ovate and the inner three segments are marked with green near the apex only. Photos by John Lonsdale. 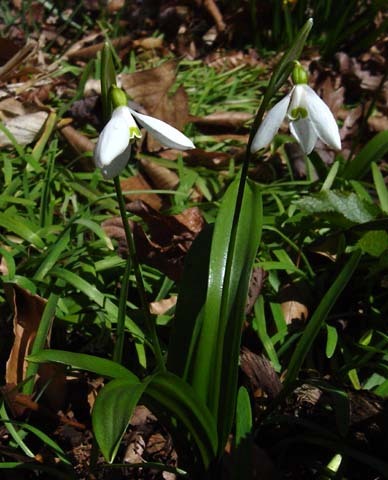 Galanthus alpinus is found in the Caucasus and Transcaucasus. 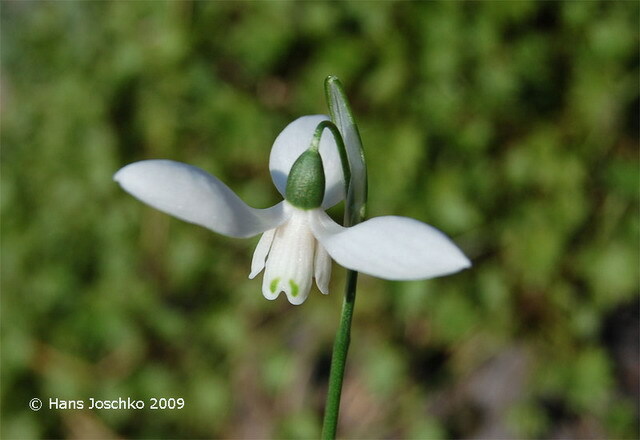 Galanthus caucasicus commonly the Caucasian snowdrop is synonymous with Galanthus alpinus var. 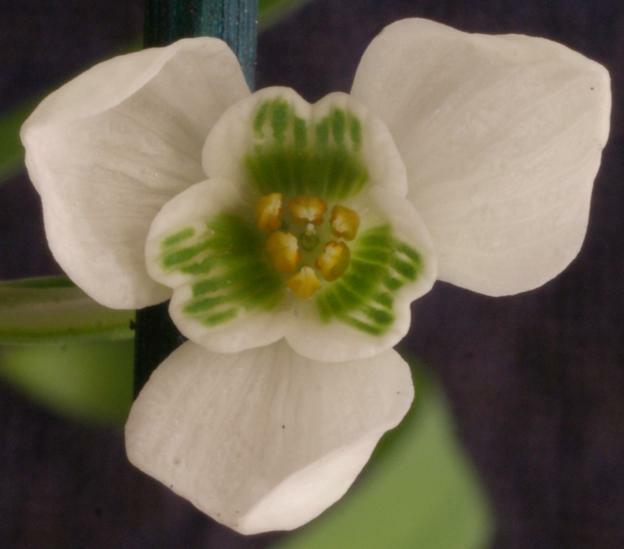 alpinus. 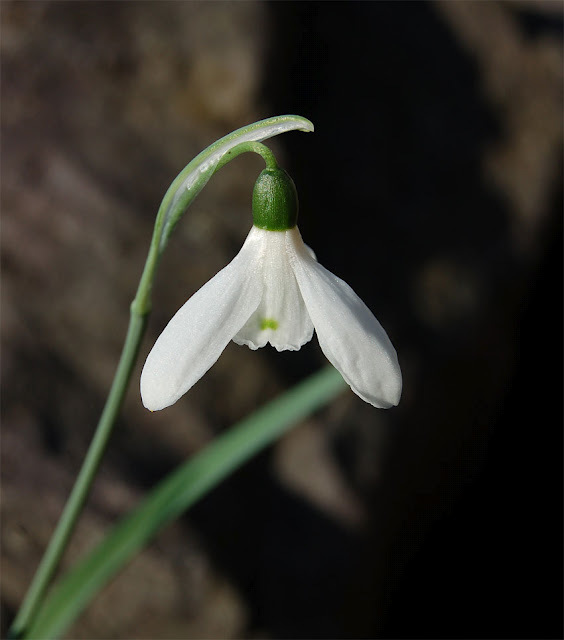 It is often confused with Galanthus elwesii var. 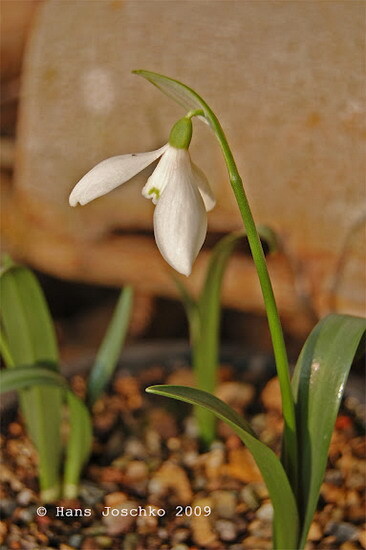 monostictus which is more common in the bulb trade. 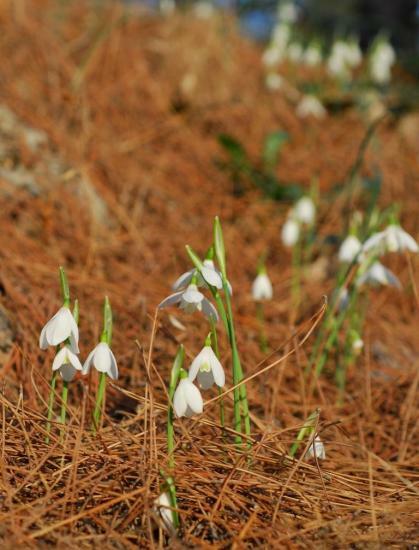 Photos of G. alpinus var alpinus taken in the Republic of Georgia by David Kikodze. 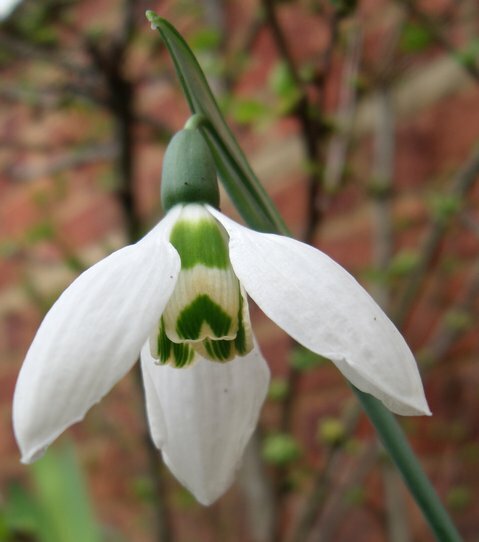 Galanthus cilicicus Baker syn. 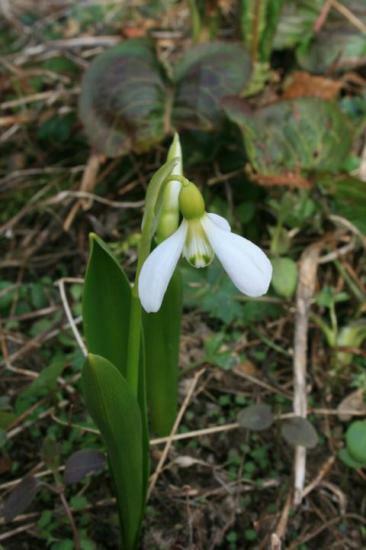 Galanthus nivalis subsp. cilicicus (Baker) Gottl.-Tann. 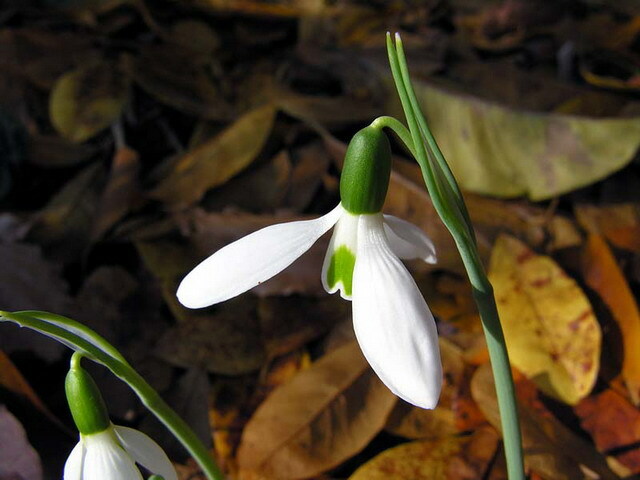 is native to southern Turkey. 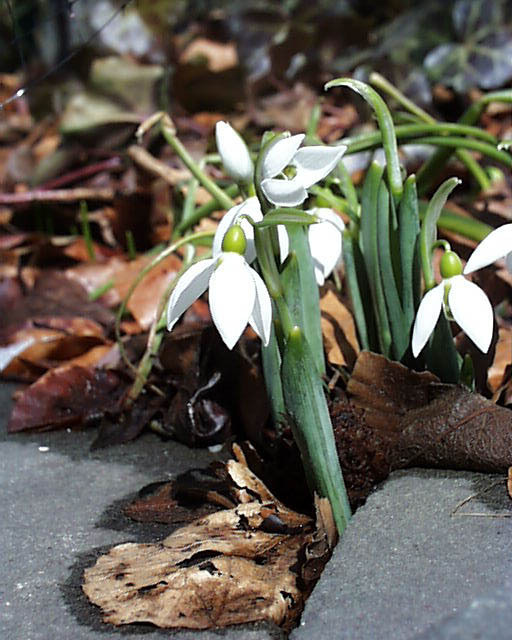 It flowers early in winter. 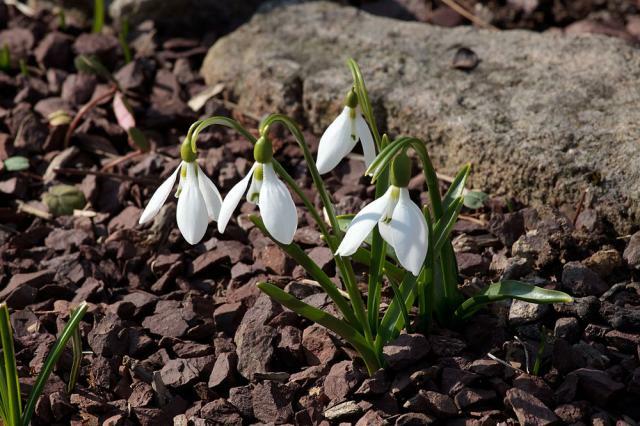 Photos from John Lonsdale and Hans Joschko. 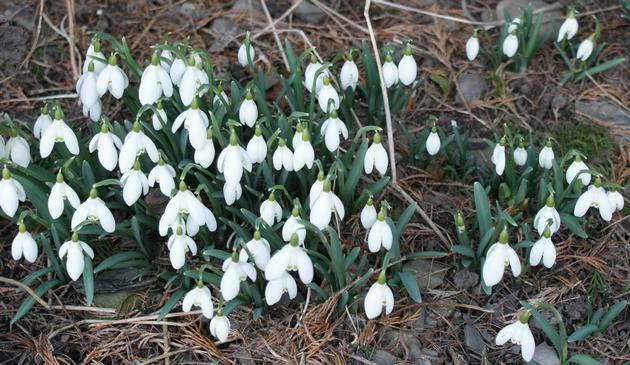 Galanthus elwesii is native to Turkey. The first photo from Arnold Trachtenberg and the second from Jay Yourch. 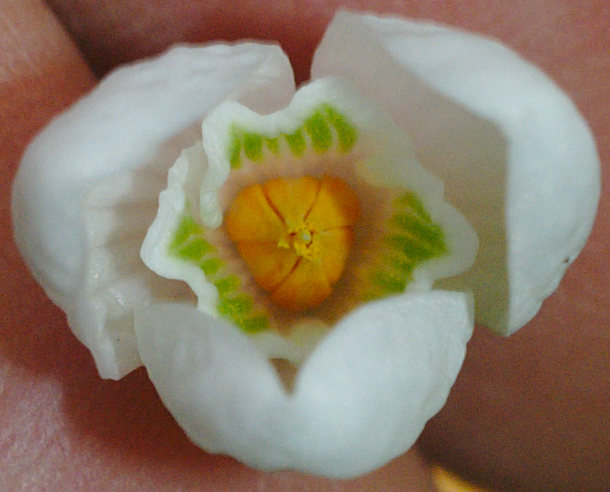 The third photo is of a poculiform flower, that has no green marks, and all petals the same length. 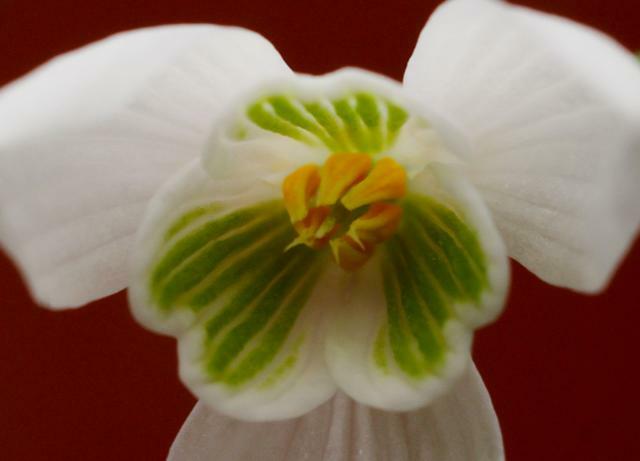 It appears to be male-sterile, as the anthers are a bit deformed and don't produce pollen. It flowers later than most of my elwesii, just opening in mid-February. 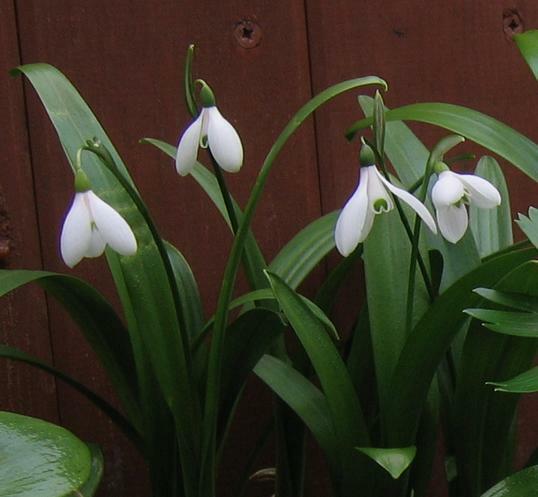 It came from my grandparents' 5 acres of woodland in Victoria, British Columbia, Canada. 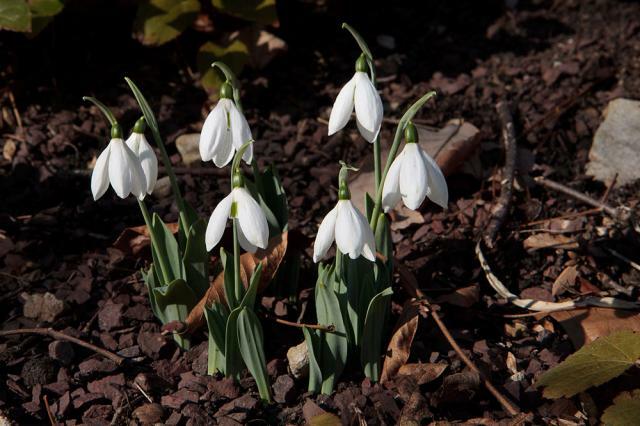 They began the garden about 85 years ago, and snowdrops have been seeding themselves ever since. 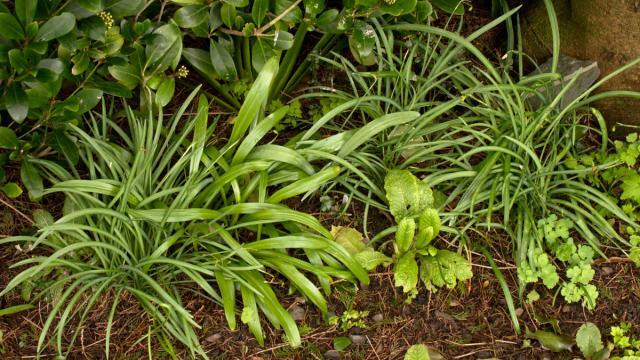 Most are G. elwesii, as it thrives in our dry summers. 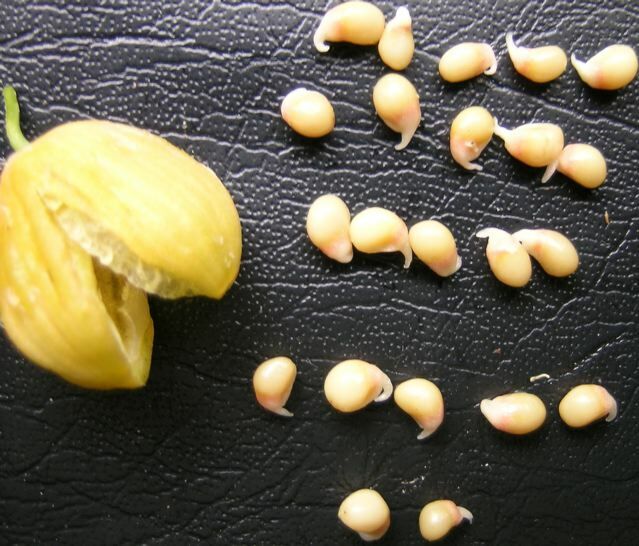 The fourth photo shows a seedpod which contained 22 seeds ripened in mid-April from a normal flower that bloomed in an unheated greenhouse at the end of January. The seeds look as though they have begun germinating, but instead, each has an elaiosome which attracts ants which then disperse the seeds. 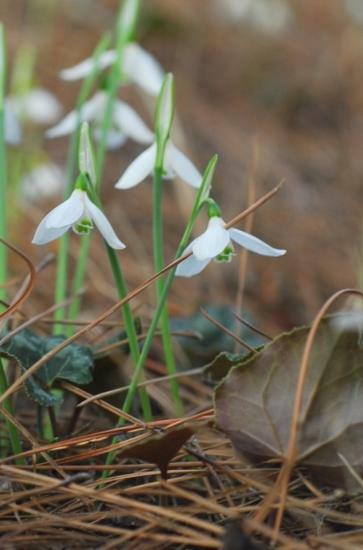 Third and fourth photos by Diane Whitehead. The last photo from John Lonsdale. 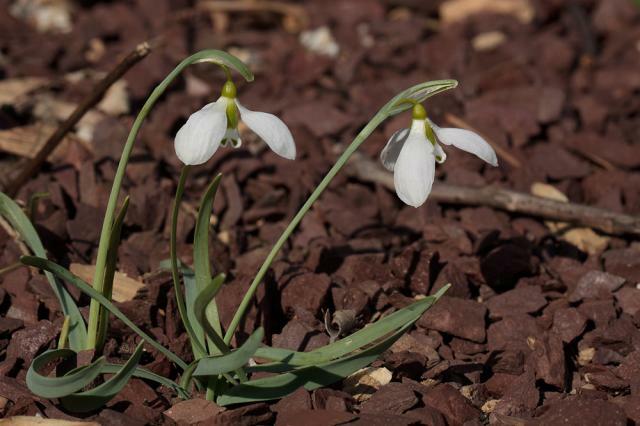 Photos by David Pilling show Galanthus elwesii (left) compared with Galanthus nivalis (right) and close-ups of flowers. 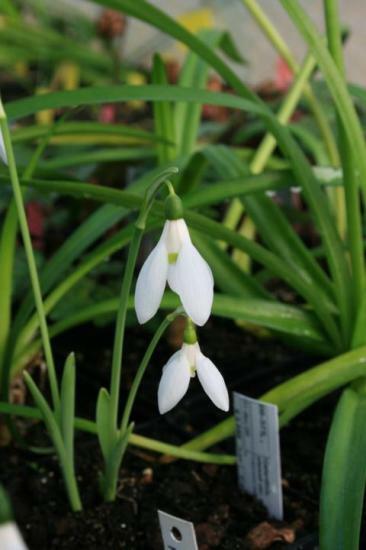 Galanthus elwesii 'Jonathan' There is much interest in non-white snowdrops, if only because of the large sums of money for which such bulbs change hands. See this PBS list discussion to learn more. 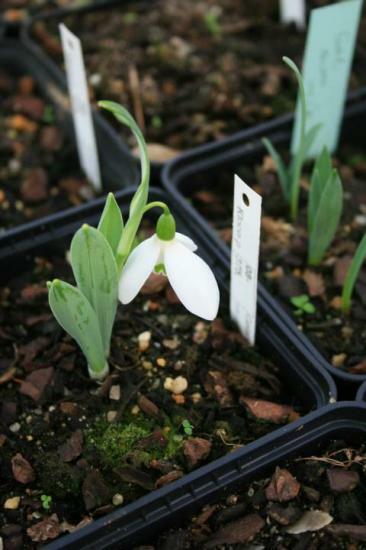 Photographs of 'Jonathan', an apricot flushed Galanthus elwesii, by Mark Brown. 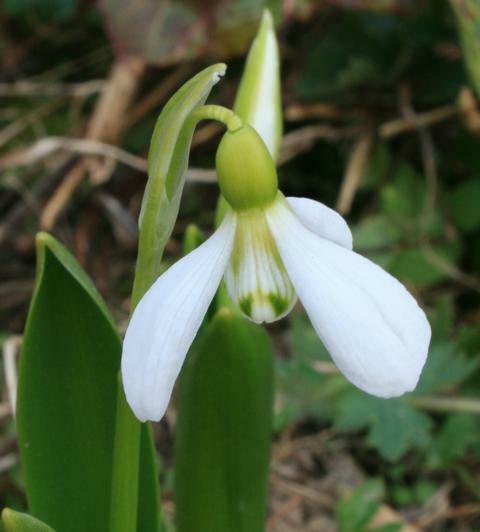 Galanthus gracilis is distributed from Bulgaria to southwestern Ukraine, western Turkey and the Aegean Islands where it grows from 100 m to 2000 m. It is found in a wide variety of habitats: mixed woodland, short grass, scrub, between rocks and on or at the base of cliffs, and next to rivers and streams, often in deep fertile soils at a depth of 10 to 20 cm. 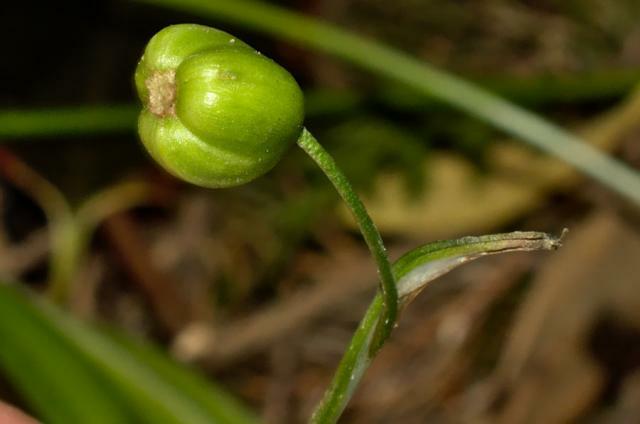 It is similar to Galanathus elwesii and has narrow, upright leaves, which are frequently twisted on the vertical axis giving the leaves a corkscrew-like appearance. Photo from John Lonsdale. 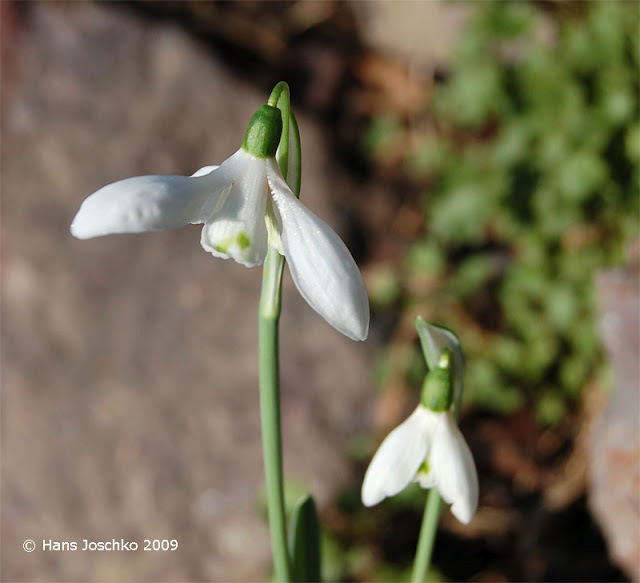 Galanthus ikariae is native to the Aegean Islands off the coast of Greece. 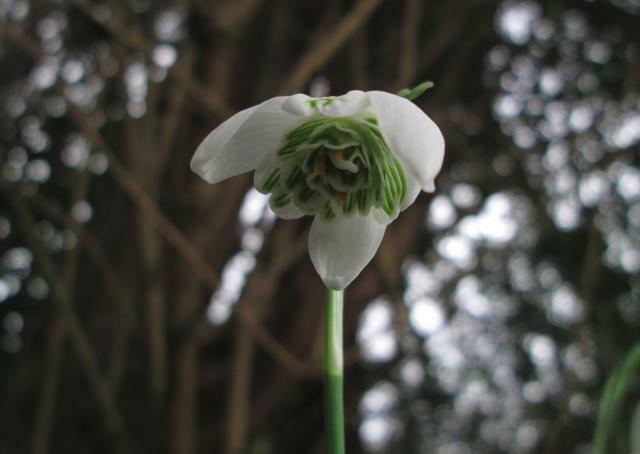 It's small, even for a snowdrop, with arching foliage, which is often matt. 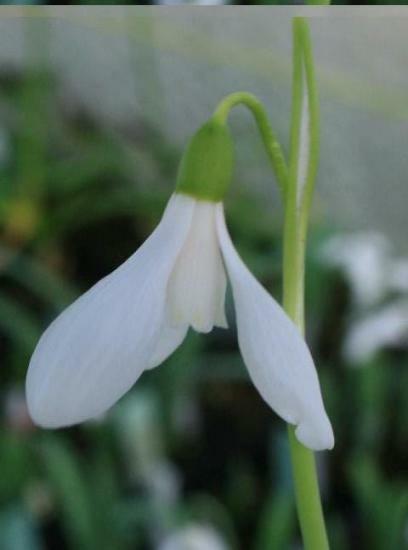 Compared to Galanthus woronowii Galanthus ikariae has an inner green mark that reaches to at least half way up and the leaves are darker. 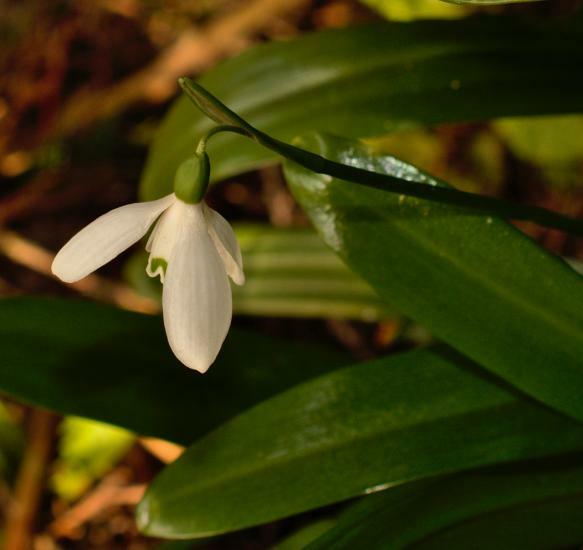 Photograph by Anthony Darby of plant growing in his garden in Dunblane, Scotland. 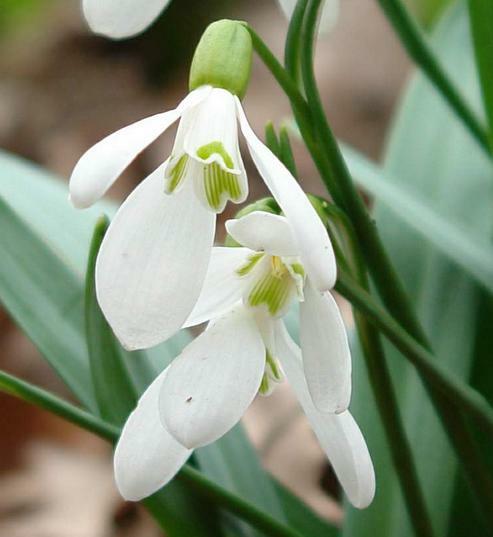 Galanthus krasnovii is native to the Caucasus. 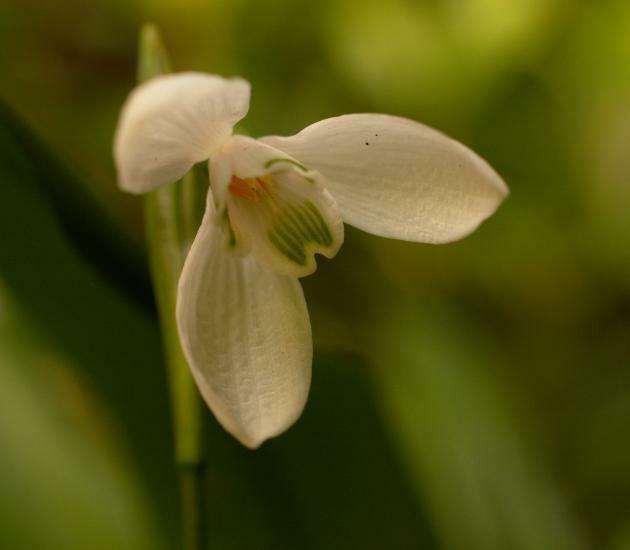 It has a very small narrow, almost pointed, inner petal. See CITES Bulbs for more information. 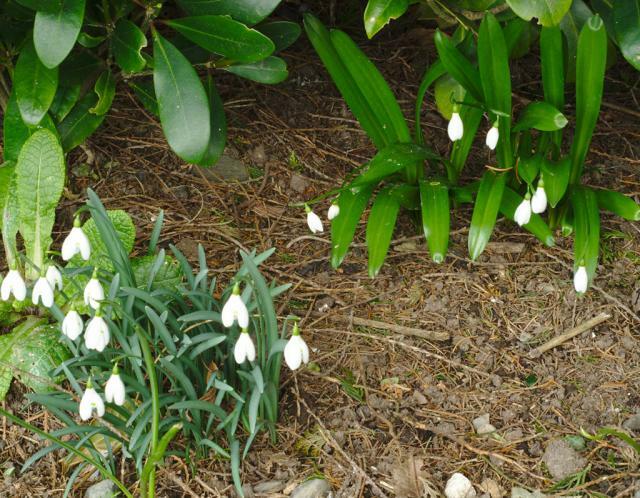 Photograph by Anthony Darby of plants growing in his garden in Dunblane, Scotland. 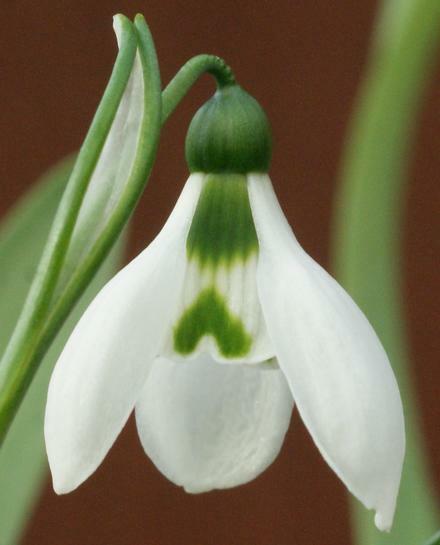 Galanthus nivalis see the Galanthus nivalis page. Representative photos of this species by David Pilling. 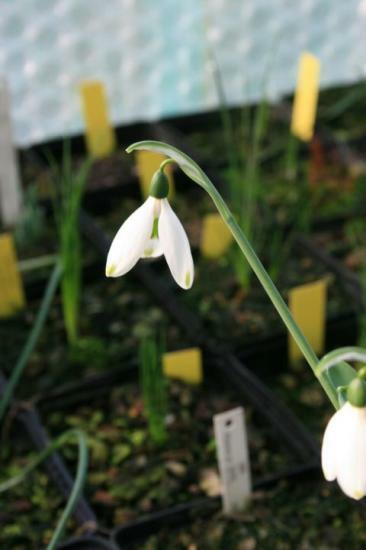 Galanthus 'Otto Fauser' is an Australian raised snowdrop named for a highly esteemed plantsman in this country. Photo in July by Lyn Edwards, Canberra Australia. 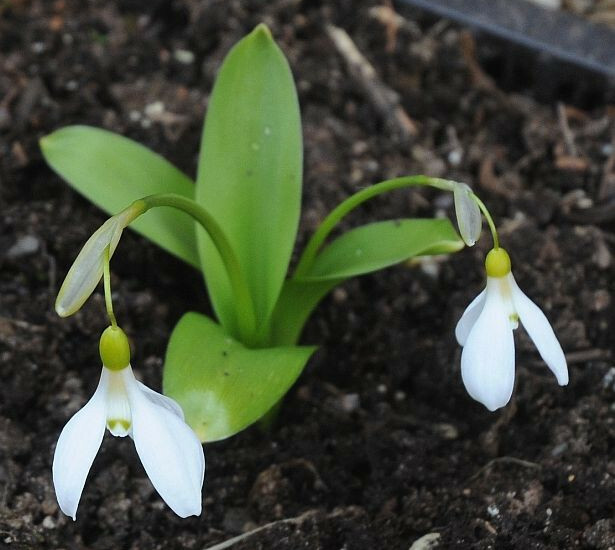 Galanthus peshmenii grows in scrub and rocky places in southwest Turkey and Greece. 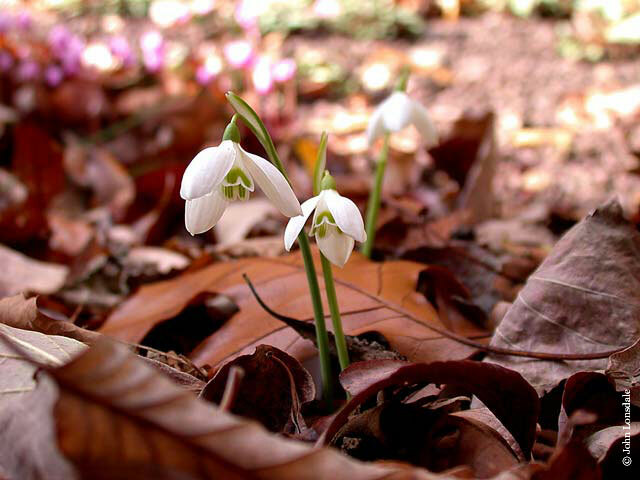 It flowers in the fall. First photo by John Lonsdale. Second photo by Jane McGary. 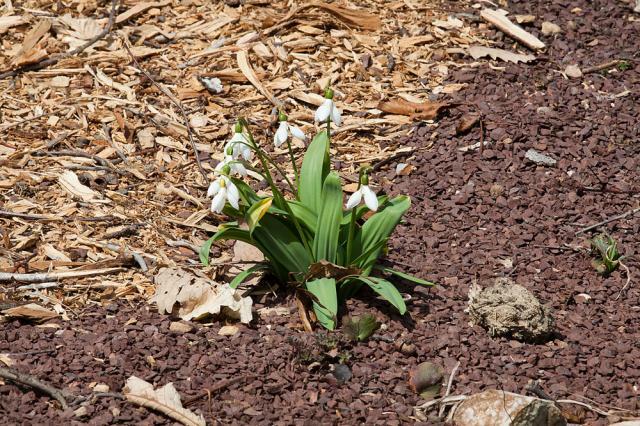 Third and fourth photos by Oron Peri show G. peshmenii in the wild in southwestern Turkey, where it favors very well drained sites such as steep banks in dappled shade. A large colony was even seen in the duff that had collected on top of a large boulder. 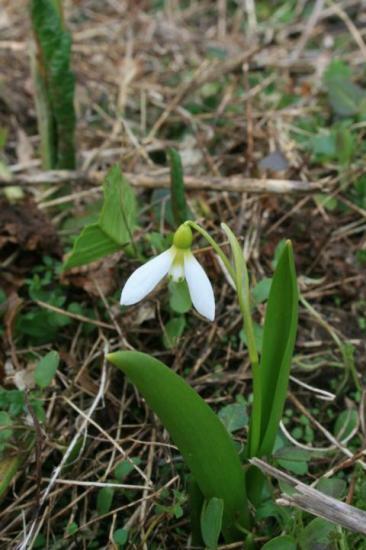 Galanthus platyphyllus from Georgia and the Caucasus at 2000 m. The Greek epithet 'platyphyllus' means 'broadleaved'; it was described in 1948 and is related to Galanthus krasnovii. 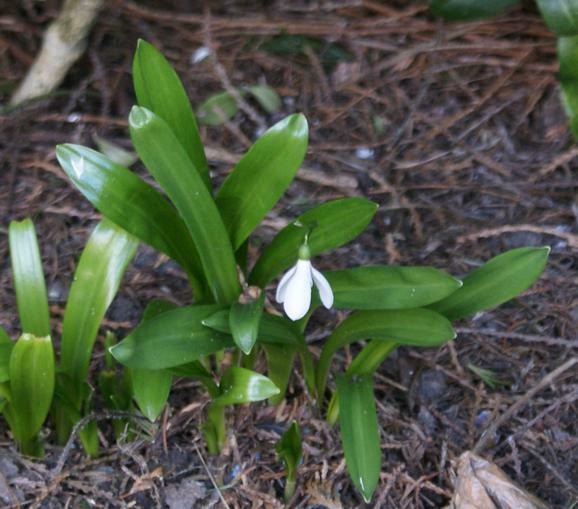 Photo 1 by Anthony Darby of plants growing in his garden in Dunblane, Scotland. 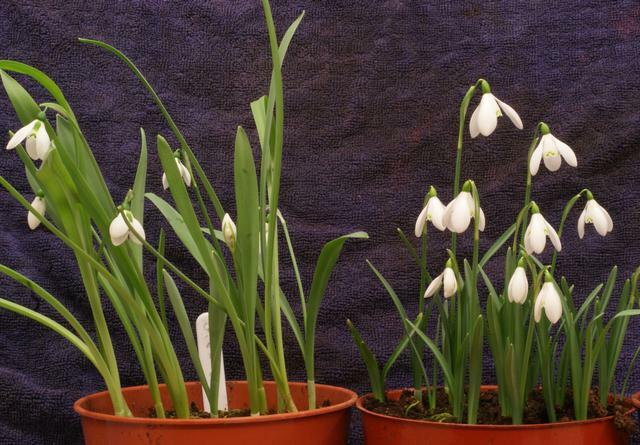 Photos 2 to 4 by Roland and Gemma who say "These bulbs I found in-between Galanthus woronowii bulbs imported from Turkey. 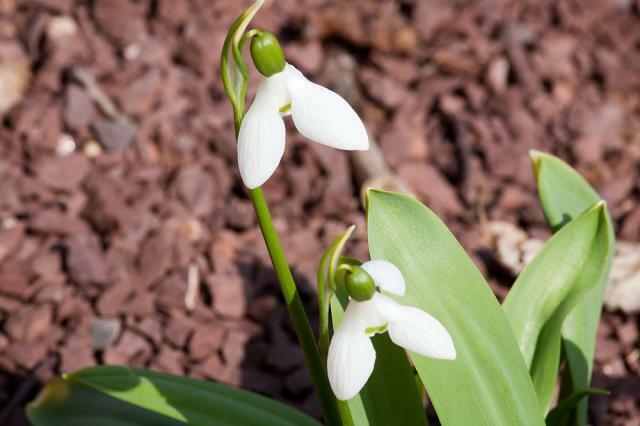 They are naturalising now in my garden". 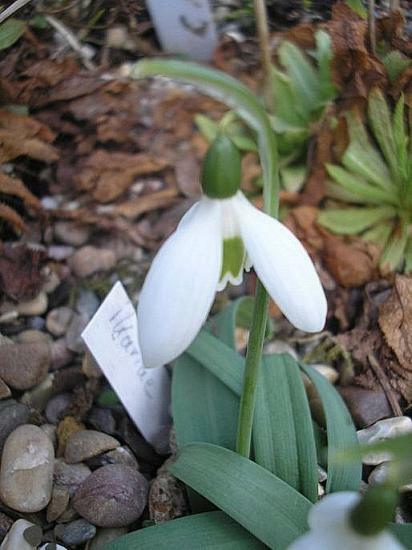 Galanthus plicatus 'Wendy's Gold' is a cultivar with yellow markings. Photos by John Lonsdale. 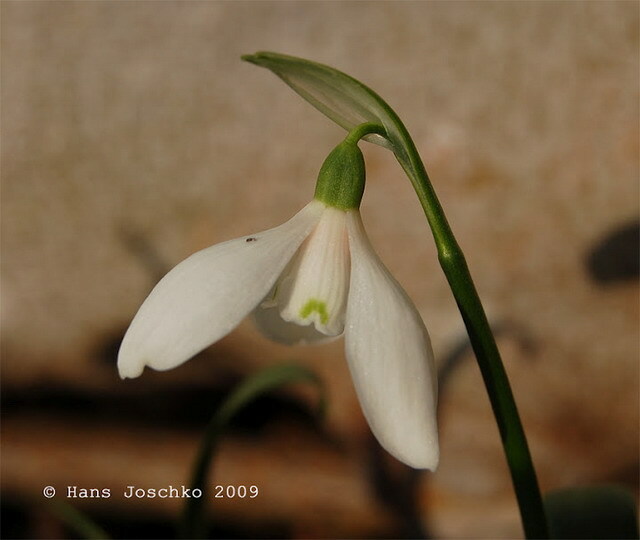 Galanthus reginae-olgae is similar to Galanthus nivalis. 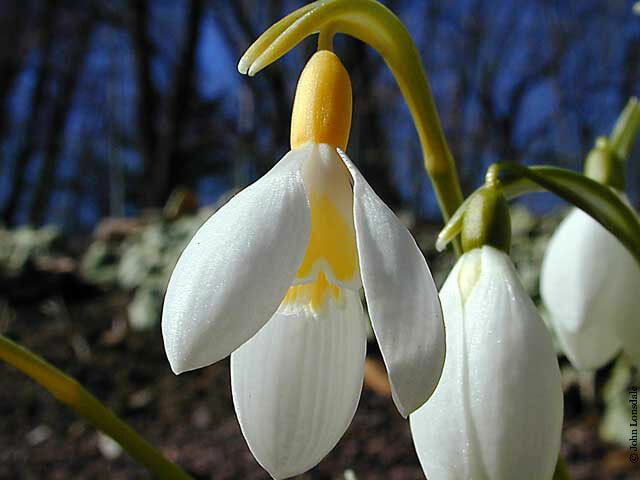 It has variants that bloom from autumn to spring and is reasonably hardy. 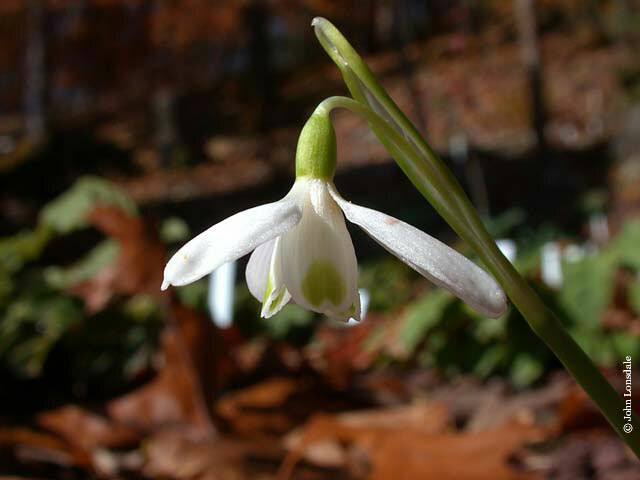 It is a native of dryish woodland at low altitudes. Photos by John Lonsdale. 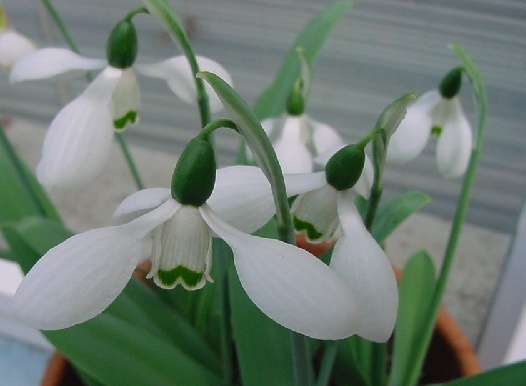 Galanthus transcaucasicus, is distributed from S. & E. Transcaucasus to N. Iran. 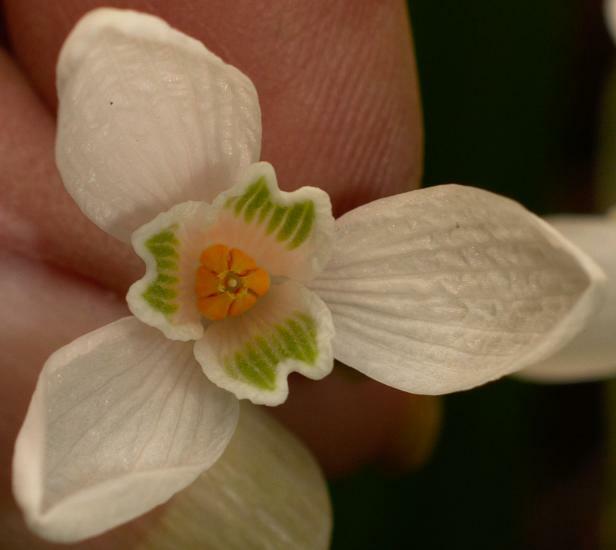 Photos by Hans Joschko who reports his plants are 6-8 cm. high. 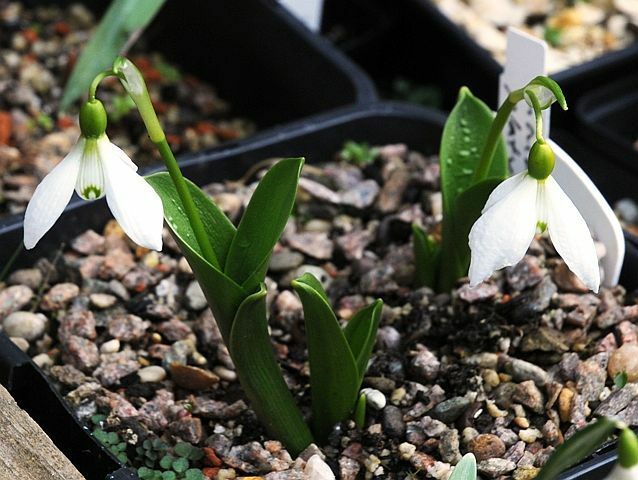 Galanthus woronowii, named for Russian plant-collector and botanist, Georg Woronow, has broad shiny green leaves; the flowers have a single v mark. 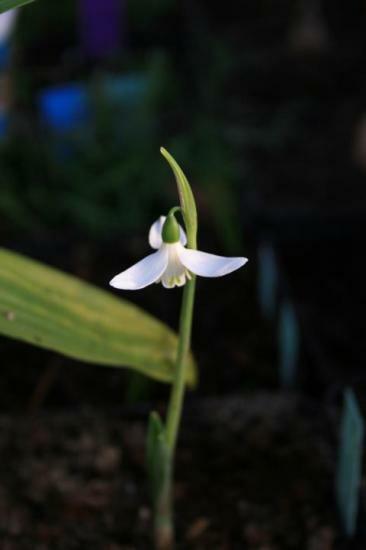 From north-east Turkey, southern Russia and Georgia, it grows 6 inches high and is similar to Galanthus ikariae. 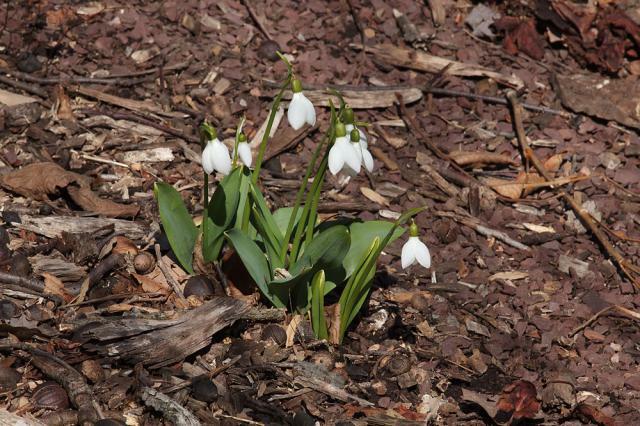 Photo taken March 2007 by Jay Yourch. Photos by David Pilling. 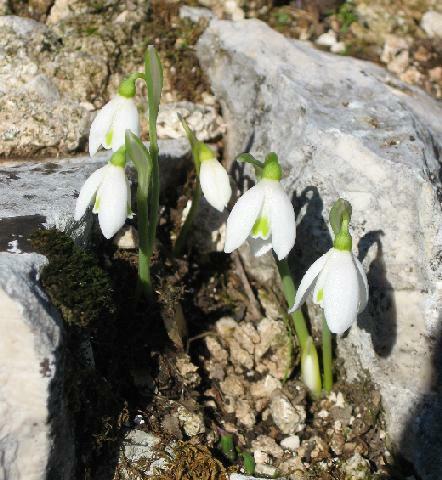 The third photo shows this species next to Galanthus nivalis. 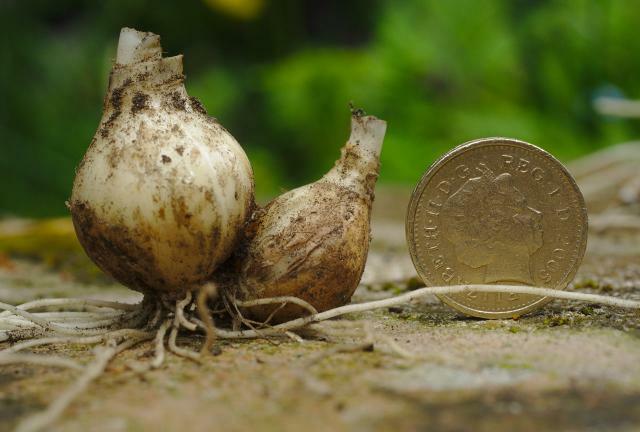 The fourth photo shows a bulb with offset and 1 inch diameter coin. 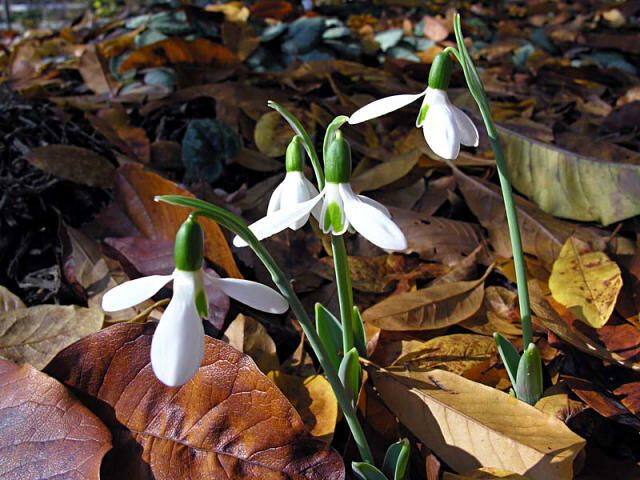 Photo 4 shows the leaves (from left to right) of nivalis, woronowii, elwesii and nivalis. 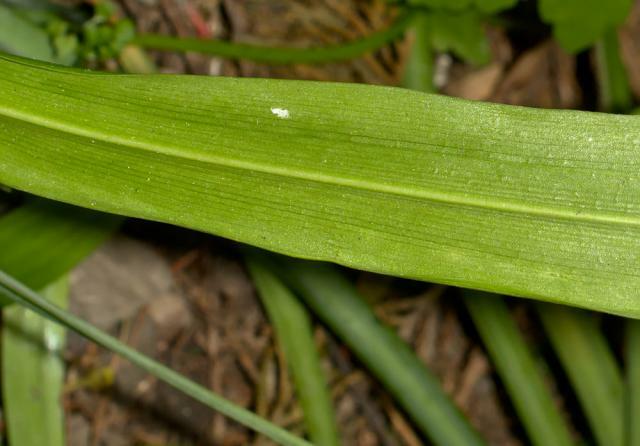 Photo 5 is of a seed pod and photo 6 shows the keel on the back of the leaf. 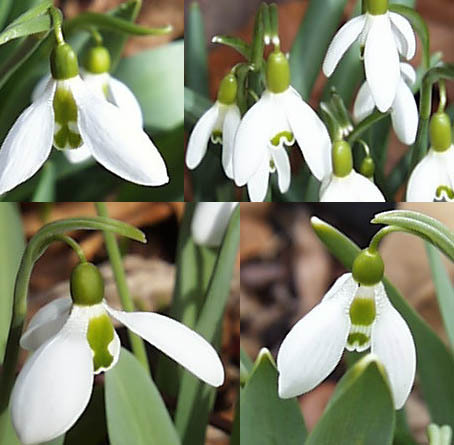 Galanthus images in a collage. 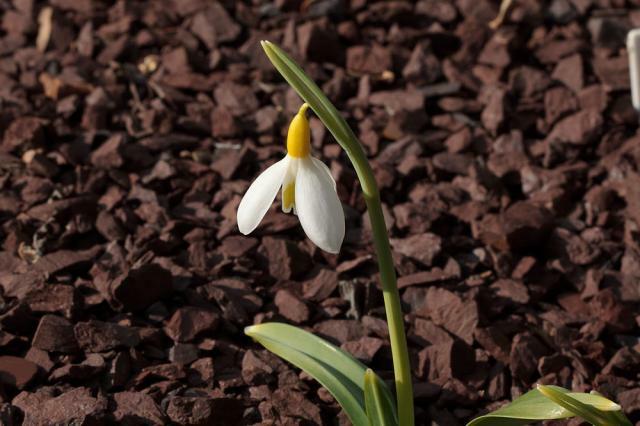 Grown and photographed in New Jersey by Arnold Trachtenberg.